Wash and boil potato and carrot with peel. Cool it, peel and grate. Also grate cucumber. Dice onion and salmon. Dress grated potato and carrot with mayonnaise and stir. Chop dill, add half of dill to salmon, half to cucumber. Cover salad bowl with cooking film, leave the edges. Spread on bottom cucumber-dill mass, press it, next spread salmon, than onion, press again, now carrot layer, spread the last potato layer and press it. Cover with food film and put in the fridge for a night, i.e. salad should soak. Before serving remove upper layer of food film and carefully flip salad bowl on plate. Bon Appetite. 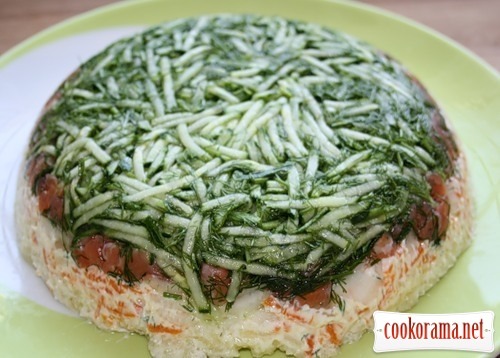 Top of recipe "Layer salad with salmon"